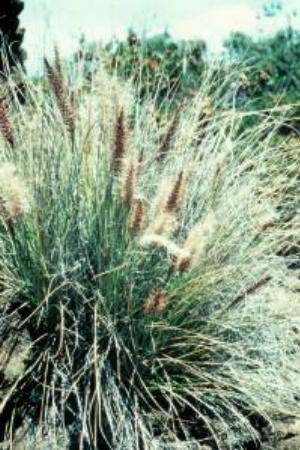 Botanical Name: Pennisetum setaceum "Hamelin"
Bloom Time and Color: Purplish pink blooms in mid summer to early fall. Description: Fountain Grass is a grass that is quite showy whether planted in the ground or in pots. It usually reaches 3-4 feet in height with a 2 foot spread. The plants are very drought resistant and should be grown on the dry side. In the winter months the plants can be cut back to a height of 12 inches. Makes a dramatic statement anywhere in the landscape!